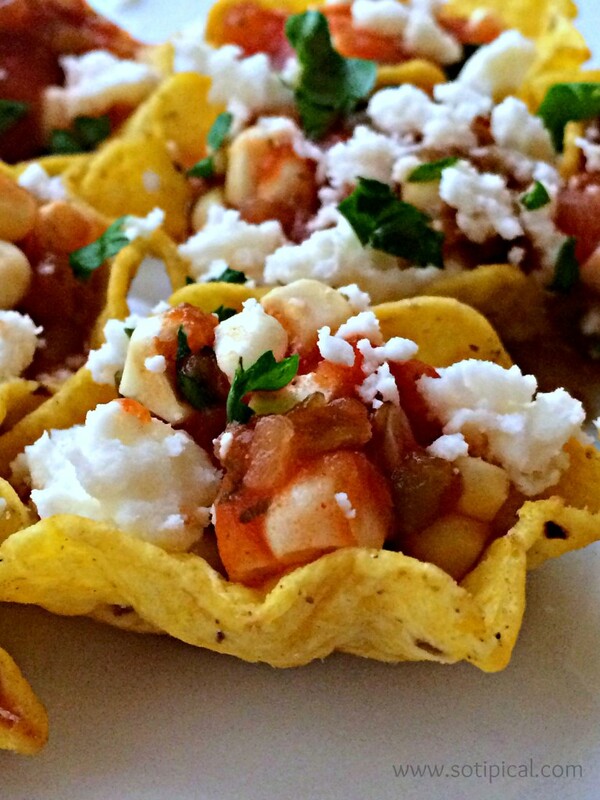 If you love salsa as much as I do, then you must try these 12 delicious salsa recipes! Great for eating with your favorite tortilla chips or to serve with meat, fish, potatoes and more! Lets begin at the top and work our way around, clockwise! Italian Blender Salsa – This recipe was created by my youngest. She loves experimenting with salsa recipes, all made in our blender! Its very easy to make and you probably have the ingredients on hand. If you are not using a blender, then dice and mince all ingredients, then mix together with oil, vinegar, salt and pepper. If you are, then cut the tomato, cucumbers, peppers, onion and garlic, at least in quarters, then add them to the blender. Include the oil, vinegar, salt and pepper, then pulse on low until the veggies reach desired consistency. Chill for about an hour, allowing flavors to meld. We enjoyed this salsa with grilled chicken. The kids made quesadillas with their chicken and added mozzarella. YUM! Grilled Salsa Verde is shared by Jeanette @ Culinary Ginger. I would love this salsa on my fish tacos! Or with chicken chili! Tomato Chipotle Salsa is shared by Debi @ Life Currents. Not only is this simple recipe delicious, but Debi also shares a tip about onions that I did not know about and I can’t wait to try it! Cherry Chipotle Salsa is shared by Erica’s Recipes. I never thought to add cherries to a salsa. I think I would love the combination of a tart-sweet cherry with the smokey flavor of chipotle! I would love this with beef or pork. Stone Fruit Salsa is shared by Loriann @ Thyme For Cocktails. I can just imagine the burst of flavors. 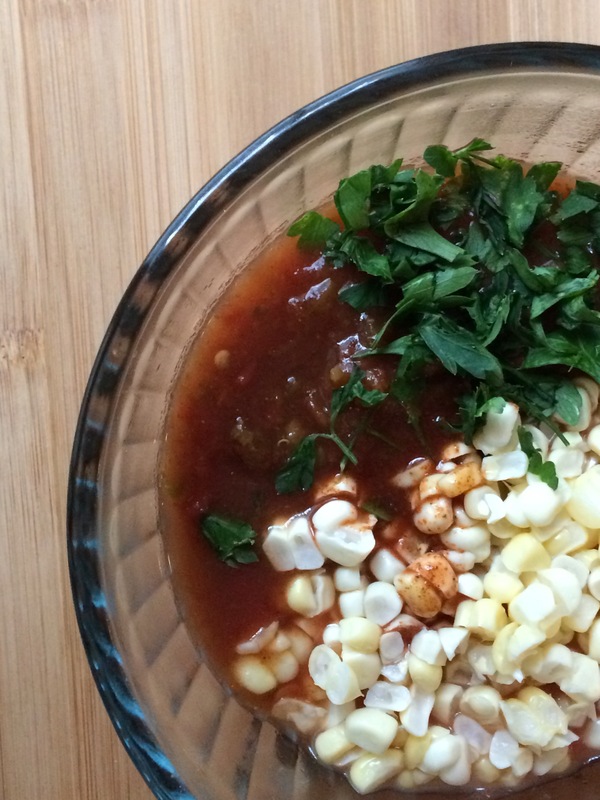 There are so many uses for this salsa! Personally I would love it with spicy blackened fish or mixed in my salad with goat cheese. Cranberry Salsa Dip is shared by Michelle @ The Complete Savorist. This is a great idea to use leftover cranberry sauce! Wouldn’t it be fabulous on a turkey sandwich or wrap?! Kickin’ Chayote and Melon Salsa is shared by The Hungry Belgian. Definitely a unique twist on salsa and I would LOVE to try this! I haven’t tried chayote squash before, but I have seen it. I will be on the lookout next time I go to the farmer’s market! Manzano Pepper Salsa is shared by Billie @ Menu of Musings. This recipe is SO easy to make and is served over huevos rancheros. 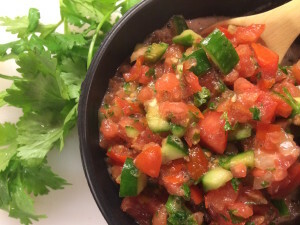 There are just a few simple ingredients in this fresh salsa with just the right amount of heat! 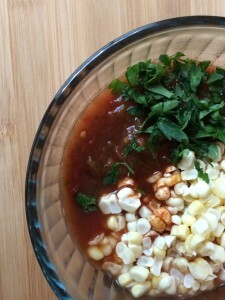 Roasted Corn Salsa is shared by Rini @ Healing Tomato. Another simple recipe using canned tomatoes. I have never made salsa from canned tomatoes before, but I think its a great idea. This is a great recipe that you can make in a pinch and half the ingredients are probably in your pantry! There are so many times my kids want to make salsa and I don’t always have enough tomatoes on hand, but I do have diced tomatoes! This great tip will come in handy! Semi-Homemade Salsa – We eat salsa so often, I don’t alway have the time to make it during the busy school/work week. So we do keep a couple of our favorites on hand for those times. But sometimes its the weekend, and we still don’t have the extra time or ingredients to make it. If salsa is a key part of our meal, then I will opt to “doctor” up the prepared salsa to give it more of a “homemade” taste. Last weekend we had a hectic schedule and I made grilled fish tacos for lunch. Though I had been to the Farmer’s Market the day prior, I forgot to pick up tomatoes! But I did get some fresh white corn and flat leaf parsley! We just cut the fresh corn off the cob and coarsely chopped the parsley, then added it to about a cup of prepared salsa. It was a perfect “last minute” salsa! There are any number of ingredients that you can add to a basic prepared salsa to give it a fresh look and taste! This salsa was great on my grilled fish tacos and we used the leftovers for an evening snack of chips and salsa with queso fresco! Pomegranate Salsa is shared by Christine @ Foody Schmoody…I’m Just Cooking. This is the perfect seasonal salsa! I saw pomegranates on every produce table at the Farmer’s Market last week! I’m wishing I picked some up because I would have made this salsa already! This is so easy to make and has a fabulous blend of flavors! Mango Salsa is shared by Lori @ Who Needs A Cape. Sweet. Spicy. Simple. Delicious! Great with fish, chicken, chips, and of course, a margarita! This is another salsa that I would top my salad with. I will often use salsa instead of salad dressing. You should try it! Thanks for looking at all these amazing recipes! 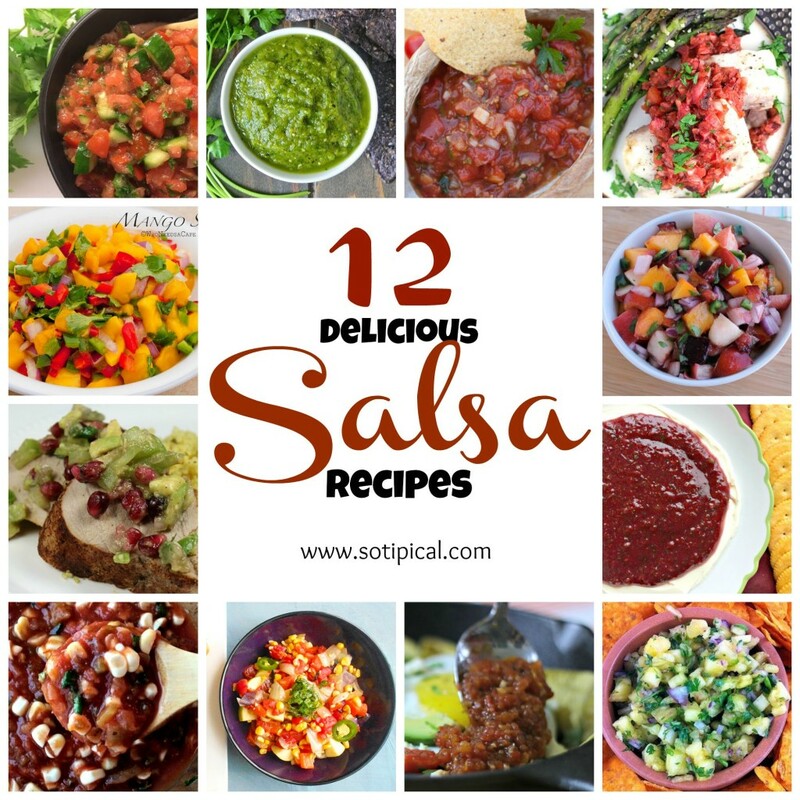 I would love to know which of these 12 delicious salsa recipes you plan to try first! Let me know in the comments! Awesome collection. Thanks for including my pomegranate salsa! Thank you so much for including my grilled salsa verde. What a fabulous collection of salsa recipes – something for every occasion! I love salsa and could eat it every day! I can’t wait to try all of these. Thanks for the collection. And, thanks for adding my Tomato-Chipotle Salsa to your round-up! All I need is a giant bowl of tortilla chips…yum! Salsa is a big favorite at my house, all of these sound so good, I need to try the roasted corn salsa soon, yum!